First and foremost, I have to apologize for my long absence. It's been a week since I've posted, but that's only because this week has been positively terrible, stressful and never-ending. But cupcakes fix things, right? I'm not going to lie to you. These are some of the best cupcakes I've ever had in my life, but they're not for the faint of heart. I worked on these over the course of two evenings. 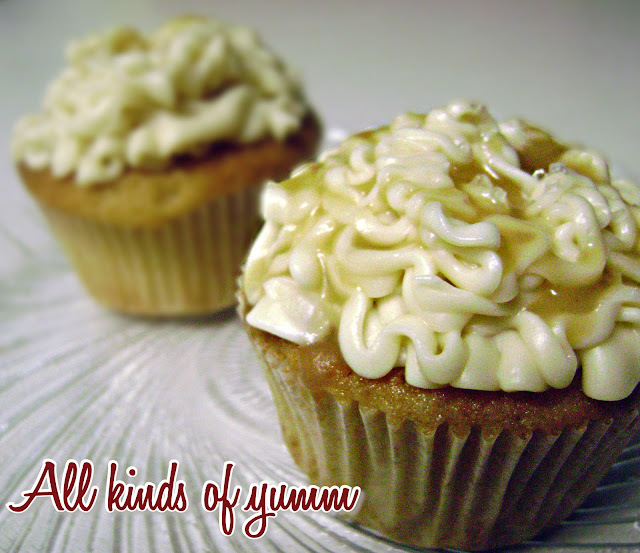 This recipe is the combination of two recipes: Sprinkle bakes triple salted caramel cupcakes and Pioneer woman's caramel sauce. If you're really adventurous (and talented, which I am not), you can stick solely with the Sprinkles caramel recipe. It's pretty complicated, and I managed to ruin my favorite little kitchen tool. Apparently melted sugar requires metal kitchen tools. Boo on you, plastic. Preheat oven to 325 degrees. Line muffin tins with papers. Cream butter and brown sugar on medium high speed until pale fluffy. Add eggs, one at a time, beating until each is incorporated. Add vanilla. Mix and scrape down sides of bowl as needed. Add flour mixture in three batches, alternating with two additions of buttermilk, and beating until combined after each. Divide batter evenly among lined cups, filling each about halfway full. Bake for about 25 minutes. When done, transfer tins to wire racks to cool for 10 minutes; turn out cupcakes onto racks and let cool completely. Once cooled, cut out a small chunk in the middle of the cupcake. We're going to fill that with caramel sauce. If you are ever required to make caramel, this is the recipe to use. I've tried so many, but I could drink this stuff. It's Pioneer Woman's easy caramel sauce, and it is absolutely divine. And easy. Which makes it even more divine. Mix butter, brown sugar, half & half, and salt in a saucepan over medium low heat. Add vanilla and cook another minute to thicken further. Turn off heat and pour sauce into a jar. Once the caramel sauce is cool, pour about a teaspoon of it into each of the cupcake holes you made, then "quark" the cupcake again with the chunk of cake you cut out. Now onto the frosting. This is the most sinful part of this whole dessert, but let me tell you something — you have never tasted anything like this in your life. It's amazing. In a mixer fitted with a paddle attachment (or just use your hand mixer), beat butter and salt together until lightened and fluffy. Reduce speed to low and add powdered sugar. Mix until thoroughly combined. Scrape down the side of the bowl and add the caramel. Beat on medium high speed until light and airy, and completely mixed (about 2 minutes). Mixture should be ready to use without refrigeration. If your caramel was too hot when added, it will cause your icing to be runny. If this happens, refrigerate for 15-20 minutes. So as you can see, this isn't the easiest cupcake recipe, but if you're up for a challenge, these are a-MAZING. oh my, do these look like the best cupcakes ever!!! I actually say this recipe on Sprinkle Bakes and I was struck with cupcake lust. I need to make these. Thanks for sharing and great photos!